Suppression is a common approach to unwanted thoughts, worriers, doubts, or urges. Unfortunately, there are good reasons why this strategy fails. 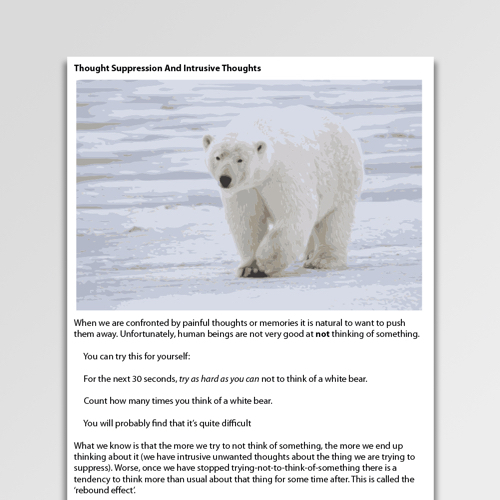 This information handout explores thought suppression and the intrusiveness of thoughts. Thought suppression is a finding from experimental psychology with particularly strong applicability to clinical work. The basic finding is that the harder one tries not to think of something, the more that item intrudes into consciousness. This effect is stronger for thoughts that have emotional content. Thought suppression is a common feature of problems such as obsessive compulsive disorder (OCD) where individuals attempt to suppress intrusive thoughts. Intrusive thoughts (and thought suppression) are also features of other clinical conditions such as PTSD and depression. There is evidence that techniques such as cognitive restructuring, or mindfulness/acceptance are helpful techniques for managing intrusive cognitions. 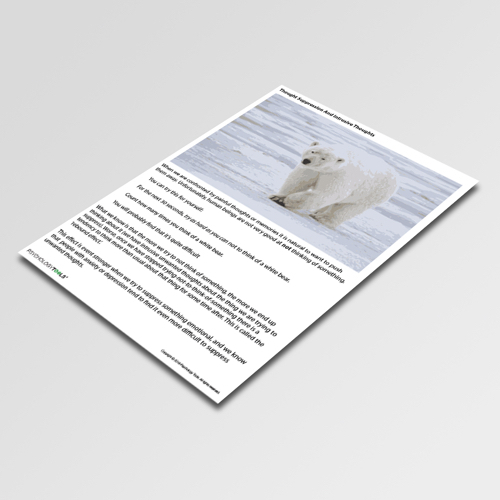 This information sheet gives a simple outline of thought suppression, and the effects of trying to suppress intrusive thoughts. Thought suppression is most powerfully explained by a demonstration. 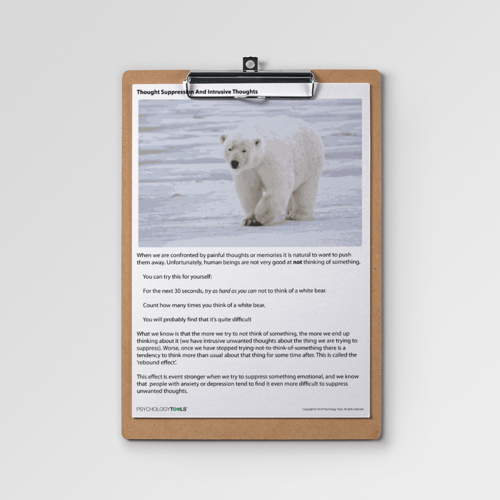 This Thought Suppression And Intrusive Thoughts information sheet gives clear instructions for how to carry out the ‘white bear’ test. Wegner, D.M. (1989). White bears and other unwanted thoughts: Suppression, obsession, and the psychology of mental control. London: The Guilford Press. Wegner, D. M., Schnider, D. J., Carter, S. III., White, L. (1987). Paradoxical effects of thought suppression. Journal of Personality and Social Psychology, 53, 5-13. Wenzlaff, R. M., Wegner, D. M. (2000). Thought suppression. Annual Reviews in Psychology, 51, 59-91.